When we last met, four years ago, she seemed unassertive and lacking confidence. Her manager and producer, Nicky Ryan, sat in on her interviews and under questioning she often deferred to him. But healthy sales have made her more outgoing, and she now defends her music spiritedly. We meet where she records her work - at Ryan's studio, set on his estate behind security gates in the affluent coastal suburb of Dalkey. She waits for me in an upstairs listening lounge, standing before a window with a spectacular view of the Wicklow Mountains. The room, indeed the whole estate, seems deathly quiet. Enya is 34, a dark, slim, strikingly attractive woman with mournful eyes and a demure manner, dressed rather formally in a blue velvet jacket and black velvet slacks. Deeply spiritual or New Age wallpaper music? The reclusive star explains to David Gritten why her ethereal pop has such a huge, devoted following. JUST what is it with Enya? Her music - a blend of secular hymns and Celtic folk melodies, sung in a pure, ecclesiastical voice - is inescapable. Over this festival season I have heard it wafting from radios, stereo systems and airport departure lounges. It has lulled consumers in shopping malls, deadened the shock of restaurant bills and provided a tasteful backdrop to dinner-party conversations. In particular, her maddeningly infectious song 'Anywhere Is' has functioned as an unofficial soundtrack to our midwinter. This is peculiar, because Enya's breathy, ethereal songs are not pop music as we know it. Her defenders liken her work to a spiritual experience; detractors call it soporific tinkling, little more than painstakingly crafted Muzak. Even more oddly, she is famously reclusive. So what's going on? What's going on is a phenomenon. In seven short years she has become one of the world's top-selling artists. Her album Watermark (1988) sold eight million records worldwide. Shepherd Moons, her follow-up three years later, did even better, selling nine million and surviving 199 weeks in the US charts. Her new record, The Memory of Trees, which includes 'Anywhere Is', has already sold three and a half million worldwide within eight weeks. The only Irish act to have sold more records than Enya is U2 - and they have been around more than twice as long. The venerable Van Morrison may have been chosen to serenade President Clinton on his triumphal recent visit to Ireland, but Van the Man's sales do not approach Enya's. Could Enya provide any reasons for her astonishing success? I went to Dublin to find out - with low expectations. When we last met, four years ago, she seemed unassertive and lacking confidence. Her manager and producer, Nicky Ryan, sat in on her interviews and under questioning she often deferred to him. But healthy sales have made her more outgoing, and she now defends her music spiritedly. "I have a lot of opinions about my success," she says. "I get mail from people of all ages, and I think these days people are busy with their lives and surrounded by noise. "So they don't take much time for themselves. You know when you go off for a walk and it's really quiet? To be alone with your thoughts? It's very calming. I think when people listen to my albums, they experience a little bit of this." She admits to being puzzled that fans invest so much meaning in her work. One can see why: on The Memory of Trees three tunes are instrumental, and there are songs in Latin, Gaelic and Spanish. "There's a sense of spirituality there," she muses. "A lot of people can sense the emotion in a performance. They don't care what the words are about - they want to experience the whole song." And is she personally religious? "More spiritual than religious. I was raised Catholic but now I derive from religion what I enjoy. I'll pray, but I mostly like going into churches when they're empty. It's calming just to sit there." Still, there is something unsettlingly devotional about her. Rob Dickins, chairman of Warner Music UK, who signed her personally, compares Enya to an angel, and has observed many people lower their voices when they first meet her. What, in reverence? "Well, yes." In fact her work has less to do with divine inspiration than with sheer graft. Enya, Nicky Ryan and his lyricist wife Roma spend two years at a time closeted in the studio, perfecting each song. Enya writes a melody, Roma adds words, then Ryan arranges it, adding dozens, sometimes 100 overdubs to each track, creating a rich, multi-layered wall of sound. For two years in the early 1980s Enya (real name Eithne N� Bhraon�in, pronounced Enya Brennan) toured and played keyboards with the Irish folk group Clannad, managed by Ryan and comprising three of her older siblings and two uncles. Feeling marginalised as the kid sister, she quit, taking Ryan with her, and together they started working in his studio, developing what we now know as Enya music. Her penchant for melancholy Celtic melodies meshed with his liking for extravagantly produced pop such as the Beach Boys and Phil Spector. "We cut ourselves off from the music scene because we felt it would be a negative influence," Enya says. "Our music was different, we'd had no success at that stage, so we deliberately didn't seek anyone else's opinions." Wasn't that remarkably self-assured? "I suppose so. But we had our own studio, and unlimited studio time. It would have been different otherwise, because studio time is so expensive." 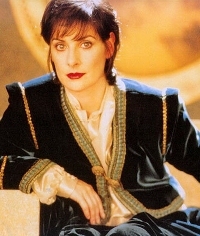 The turning point came when Dickins fell in love with Enya's mostly instrumental soundtrack for the TV series The Celts, and promptly took her on - against the advice of many colleagues. "I signed her as an artist with no commercial potential at all," Dickins says now. "I was just a fan." But Watermark, with its naggingly insistent hit single 'Orinoco Flow', vindicated him and now he is content to sit out the long gestation period between albums while the Enya troika painstakingly polish each new track. This working method has disadvantages. "We're our own worst enemies in knowing when a piece is completed," Ryan reflects. "Listener fatigue sets in and we're unable to judge." Dickins was invited to hear The Memory of Trees earlier this year, at a point when Enya felt it still needed far more work. "But most tracks were ready," he says. "They sounded absolutely superb. I feel like I'm their bridge to the real world. I deal in commerce. I have an idea of how people will respond to the music, whereas they're very isolated creatively." Yet Enya likes it that way professionally and personally. No other best-selling international artist maintains such a low profile. "People call me reclusive because I've kept a private life," she muses. "But that's been important to the music. Some artists are bigger than the music. With me the music's bigger. Even now I think if I got caught up in a glitzy entertainment world, my music would suffer." Her most devout fans seem to agree. Scan her unofficial web-sites on the Internet and you find Enyaphiles who view her as little short of a spiritual leader. It adds up to a cult following of sorts - if a huge one - and it is a slight relief to escape the monastic atmosphere of her studio and return to the real world of Dublin's shopping centre. But there is no escape here: the ubiquitous 'Anywhere Is' blares from HMV Records on Grafton Street, where the tills jangle merrily. It's an odd paradox for music aimed at liberating people from the harsh noise of modern life. Enough Enya for one day, I decide, and nip down a side street to James Joyce's preferred watering-hole, Davy Byrne's pub, for a quiet pint of Guinness. I leave you to guess which song was playing on the radio inside. Note: Transcribed by Tom McClintock. This article is similar to another by the same author that appeared a few days later in the Los Angeles Times.